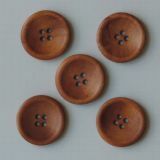 Wooden Buttons 5/Pkg - MAYA ROAD-Wooden Buttons: Vintage Stained. Great for adding that special touch to your cards, layouts, altered art or any other artwork! This package contains five 1-1/8 inch wooden buttons. Imported.